Instead of concentrating on my current gear I thought i'd cover all the cameras I have ever used in my photographic journey so far up until my first digital model in 2005. The Camera that started it all, the Halina 35x from Hong Kong. This was given to me by my Father in 1982. It was the camera he used to document our camping trips to France .With a little lesson from him on aperture and shutter speed correlation in the back garden I was off on my new adventure, believe me this camera had many drawbacks. First being the lever that needed to be cocked to fire the shutter , second it was a rangefinder with manual focus, which meant having a pretty good sense of distance. But it is a beautiful solid camera and made me feel like David Bailey. I took this on a holiday with the Scouts to Denmark and left it in a gift shop by accident. I needed to desperately upgrade to a SLR camera and with a very limited budget allowed to me I had 2 choices, a Praktica MTL3 or a Zenith TTL. Both cameras having been produced behind the Iron curtain I was somewhat reticent but didn't have much choice, Japanese cameras were at that time over 100 GBP (the Praktica was about 39 GBP) I picked the Praktica because it was about half the weight of the tank like Zenith, and this time I felt like a Cold War spy. The camera was a fully manual gem, having a physical light meter needle inside the viewfinder which could be activated with a control lever next to the shutter release, an old school split focus center section on the lens and a sturdy vertical metal shutter. My main lens for this was the Pentacon 50mm but also had the Carl Zeiss Jena 70-210mm. I still have both the camera and the lens and plan to bring them out of retirement really soon. I needed to upgrade again and my Father was getting rid of his Fujica STX-1, actually 2 of them, so now I feel really professional, I could have 2 bodies with different speed ISO film in each one, and actually have a camera made in Japan, onward and upward ! I now have a camera with a bayonet lens system, no more fiddling around trying to get the screw lens on. This was a nice small light SLR but one drawback of this camera was the cloth shutter , which began sticking later on and made for some half exposed shots. The Fuji had a good run, it saw me through my first visit to the United States and an extended stay at Kahana's stunt school ranch in the sweaty depths of central Florida. My Fujicas slowly wore out, shutters getting worse to point of sticking half open, an inevitable replacement was due. Enter the Minolta 7000, .. wow auto focus is upon me !, and also the first time I have not had to wind on the film manually. Now I don't have to take the time to get that split screen gizmo perfect. Quite a leap forward in camera technology , a lot of electronics in this one compared to my previous all mechanical cameras , nice model , light and a little fragile with slow focusing compared to todays models. 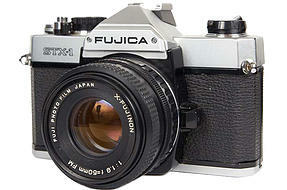 It was my least favorite camera due to its complex design. Well all those electronics finally gave up the ghost and it died on me. Enter the next model, the Nikon FA, back to good a old mechanical camera. I was really excited to have a camera made by one of the leaders in camera production and didn't really miss the auto focus feature. I took this camera with me on my first visit to New York City back in 1994 and got some fantastic photos, unfortunately whilst I was travelling in NYC a couple of years later I lost track of those images and only have 1 of the exposures due to an enlargement I made. Enter my first Canon, the Canon 3000N . 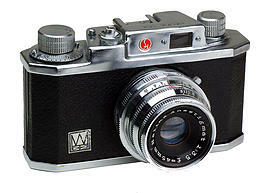 This was one of Canon's last 35mm film consumer SLR cameras for EF lenses. I liked this camera because it was very small and very light. It had a reverse wind system, meaning your film wound out first and any shots would be protected because they were wound back into the cartridge as they were taken, protecting them if the back was opened accidentally , a pop up flash for emergency illumination, but very expensive batteries. With this body I had the Sigma 28-300mm zoom, a very compact, full range zoom which I left on the camera permanently. The biggest jump in my photographic journey, the change to digital with the Canon Digital Rebel. What a giant leap for someone who had started shooting in 1982 and had been using film for over 20 years. Unlimited capacity at last, well not quite, compact flash cards were extremely expensive even in 2005. I had two 512mb cards, yeh 512mb ! . so unfortunately I still had to be frugal with my shots, deleting many unwanted ones as the day went on to make room for new ones. The sheer joy of being able to see the photos straight away though was remarkable. This was the camera that really pushed me into a new realm of photography and was the model I took along with me when I started working for the photographer Gene Martin. Coupled with a reasonably priced Sigma 18-50mm lens I pushed into a new and exciting exploration into a wide angle shooting style.